Mission San Juan Capistrano is proud to partner with longtime Mission supporter Mrs. Joan Irvine Smith to display reproductions of historic plein-air paintings from her private collection at the Irvine Museum. Mrs. Smith and the Irvine Museum are committed to conserving the art of plein-air painting and its ability to record history in a unique and beautiful way. It is through this parternship that we are able to bring these reroductions of historic landscape paintings to the Soldiers Barracks Gallery at Mission San Juan Capistrano, historic landmark and museum. 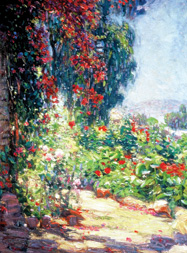 The Irvine Museum is the only museum in California dedicated entirely to the preservation and display of California Impressionism or Plein-Air paintings, an art style that flourished in California from 1890 to 1930. Mrs. Smith and her mother, the late Athalie R. Clarke (1903-1993), founded the museum, which is located in the City of Irvine, in central Orange County, in 1992. Madeline Swinden, Founding Chair, Mission Benefit Gala, stated "The art is such great representation of what the mission life was all about... the missions were the vanguard of our cities, as most of our major cities were started around the missions and presidios (Spanish forts) in California. The missions settled in areas that had good soil, plenty of water and near native American villages, which also are the prerequisites for founding cities."